In May 1939, no one could have predicted that a minor boundary dispute between the Japanese and Soviet forces over the western border of Manchukuo would erupt into open war... take command of your men and fight for the defence of Mother Russia, or the honour of the Emperor! 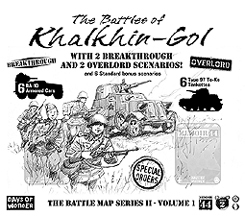 This expansion also features two new, large format, ready-to-play Overlord scenarios: The Khalkhin-Gol Encirclement and Cape Torokina Landings. These two Overlord scenarios provide hours of additional fun. The new Armoured Cars and Te-Ke Tankettes are put to good use in all of these scenarios, providing tactical advantage to the players who learn how to use the full range of their capabilities. This not a stand-alone game. Requires one copy of Memoir '44, as well as the Terrain Pack, Eastern front and Pacific Theater expansions. The Equipment Pack and Winter Wars expansions are also recommended.